Rediscover is a new initiative that allows postgraduate students of History of Art to put their original research and knowledge into practice through three displays in Talbot Rice Gallery over March and April 2015. Following a new taught-course working directly from the University’s Torrie collection the students have explored the history of these artworks to uncover the social and political circumstances in which they were made or acquired. Their projects will contribute towards a major show of The Torrie Collection planned for 2016. Art collections may have long and eventful histories of their own. It is easy to forget how historic artworks have not always been on show in a museum or a gallery. This exhibition calls attention to the display and viewing experience of artworks in the early nineteenth century British home of Sir James Erskine, 3rd Baronet of Torrie (1772–1825). Sir Erskine bequeathed a large portion of his art collection to the University of Edinburgh, where it is now known as the Torrie Collection. 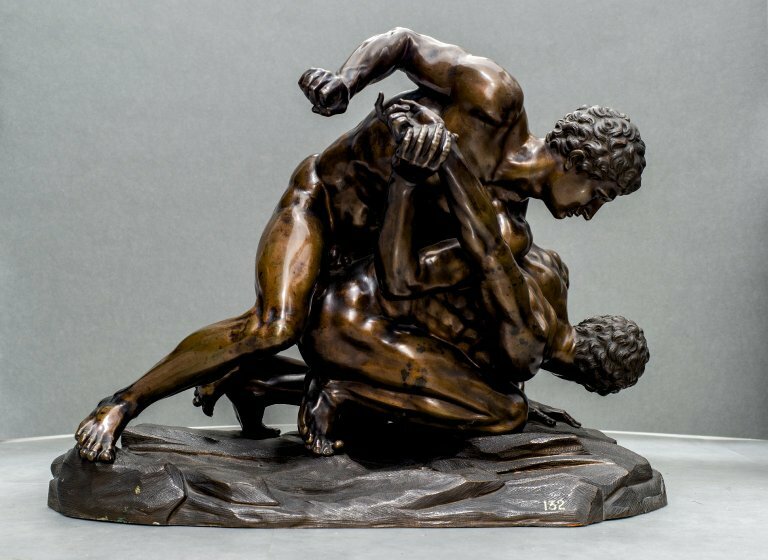 Through the display of two pieces from the Torrie collection, ‘Living with Art’ explores the juxtaposition between calm landscape paintings and action-filled bronze sculpture; Massimiliano Soldani’s (1656-1740) expert imitation of the classical sculpture of the Wrestlers, and Jacob Isaacksz van Ruisdael’s (1628-1682) painting, A Wood Scene, invite different modes of spectatorship. This exhibition will consider the concept of multi-angle viewing and fixed perspective to reflect the original display of these artworks within Torrie House in Fife, Scotland. Flags can inspire a nation as powerfully as they can define a nation. After two centuries of Spanish rule, the Dutch emerged from their fight for independence during the 80 Year’s War as the United Provinces in 1648. Searching for a national identity became a priority for citizens and artists alike. Artists looked to the shorelines, as the Dutch prided themselves on manufacturing the best ships throughout the world. William Van de Velde the Younger (1633-1707) depicted his patrons’ vessels in exact likeness from calculated studies. His contemporary, Ludolf Backhuyzen (1630-1708) emphasized the atmospheric effects of the Dutch skyline. These two artists were the most prolific marine painters of the Dutch school. This exhibition addresses these artist’s attempts to capture the era’s sense of patriotism and nationalism through maritime scenes. 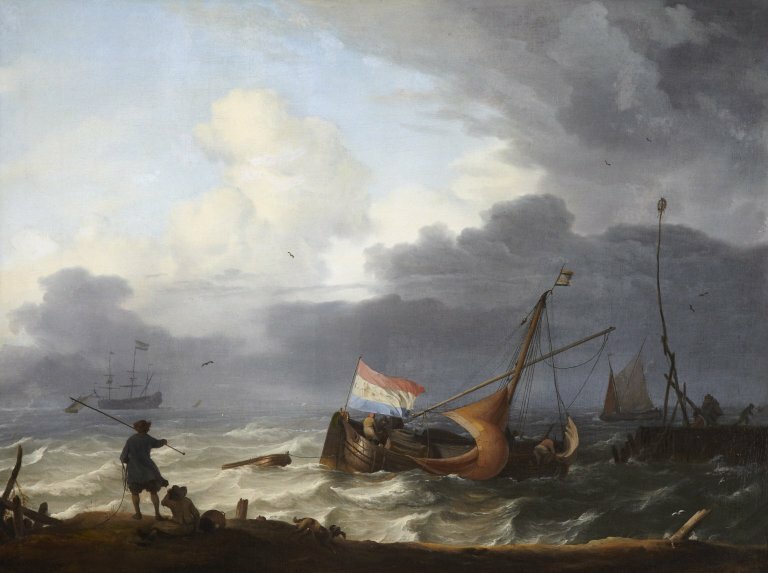 Van de Velde’s Fishing Boats in a Calm (1658) provides a record of the day-to-day Dutch economy, while A Squall: A lugger running into harbour is a politically charged response by Backhuyzen to national attitudes of the time. In either case, the Dutch flag was incorporated as an important national icon. But how far can our interpretation push these artists as representatives of their country depicting a portrait of Holland? This display highlights interrelations between paintings of classical architecture and the NeoClassical architectural fabric of Edinburgh. This exhibition aims to demonstrate the Scottish Enlightenment taste for the Neoclassical in both architecture and art collecting. This exhibition features two capriccio paintings by the seventeenth-century painter Giovanni Ghisolfi (1632-1683). 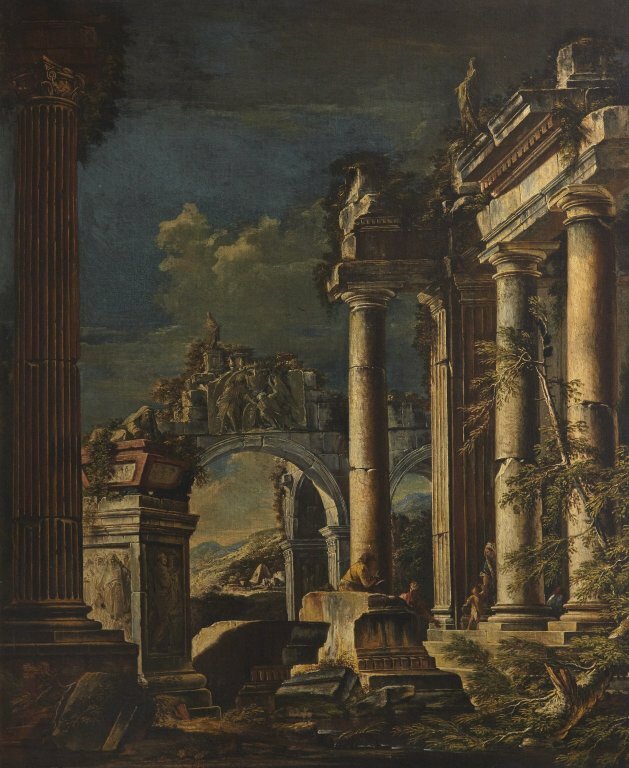 Capriccio paintings of illusionistic classical ruins were a popular genre collected on Grand Tours in the late eighteenth century. Athens of the North takes place in the Old College’s Georgian Gallery, which reflects the architectural style of Ghisolfi’s paintings. Old College was designed by William Henry Playfair (1790-1857), who was also responsible for designing much of Edinburgh’s most iconic NeoClassical architecture. William Henry Playfair designed much of Calton Hill, which brings together classical ruins and romantic atmosphere. Similarly, Ghisolfi’s paintings exhibit a romantic vision of an idealised past while retaining a classical idea of architecture, foreshadowing the Romanticism of the nineteenth century. By connecting these paintings to Edinburgh’s architecture, this exhibition once again brings exteriors into the interior, a central aim of NeoClassical decorating. Ghisolfi’s paintings, much like Playfair’s architecture, reflect the yearning for a lost world and the endeavour to make the present live up to an idealised past.